Release date: 24.10.2007 SOLD OUT! This unique compilation spotlights the best tracks of Mocambo Records’ scarce 7 inch vinyl releases that took the deep funk scene by storm in summer 2006. Along with the labels own productions (Mocambo Allstars, The Bacao Rhythm & Steel Band and Gizelle Smith), the first releases host new recordings by obscure English groups like The Delta Rhythm Section, The Sound Stylistics and the supreme Vinylizor Productions team (Jay Glover, Gary Crockett & Dominic Glover), together with unreleased tracks by all time greats such as the James Taylor Quartet and Speedometer. Not only the fact that all of the recordings were previously unreleased gems, but it was also the way in which the 7″ singles were released, that made the records desireable collector’s items in their own right. While it would have been possible to sell a 1000 copies of each, the label decided to stick with the charm of obscure and forgotten Funk 45s by pressing no more than 300 copies of each release. Manufactured at a private pressing plant in Germany, the records not only delivered the sound of rare Funk 45s, but also the look and of course, the quantity. One of the Delta Rhythm Section’s 7 inches did not even reach the amount of copies that had been licenced because the stamp broke before the whole edition could be finished. Needless to say, the records were sold out in a short time. For people who missed the limited vinyl edition, it is still impossible to get hold of the brilliant tunes. Popular demand caused the label to “re-issue” the best sides of the original 45s on this compilation so that all fans of the material can now enjoy the music without breaking the bank. The selection of tunes included in this compilation is a broad variety of styles in the genre of funk. While the Delta Rhythm Section provides a more perfected version of mid-seventies big band funk, the Sound Stylistics stand for the raw garage sound of small labels around in the early 70s, with a wild instrumental style that became known as ‘deep funk’ (hence the library album title of the same name). The bonafide productions of Jay Glover, Dominic Glover and Gary Crockett focus on classic vintage keyboard instruments as the Minimoog, Hohner Clavinet D6 and the Hammond B-3. The Bacao Rhythm & Steel Band brings some West Indian flavour to the mix by performing a classic Meters track with Steel Drums and killer breakbeats, showing that New Orleans is just a stone’s throw away from the South Caribbean islands of Trinidad & Tobago. 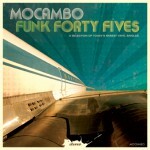 The UK’s primo funk outfit Speedometer round up the compilation with uptempo Latin-tinged dancefloor funk while the Mocambo Allstars pay hommage to the late James Brown, the J.B.’s instrumental sound and early rap groups with three of their own productions. Other artists such as the James Taylor Quartet and Ian Langley represent the cinematic side of funk with their takes on blaxploitation scores, providing listeners with the perfect underscore for vintage urban drama, big city hustle and car chase scences. 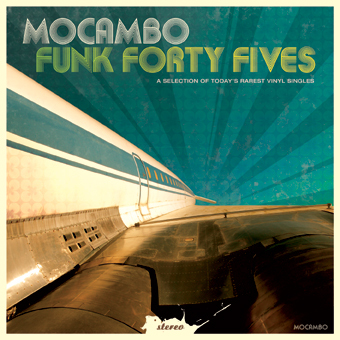 MOCAMBO FUNK FORTY FIVES by V.A.